News™: is a strategy board game. Played by 3 or more players. Playtime is about 45 minutes. A) Reporter--Any player or person playing the board game "NEWS™. B) Scoop----A sentence made at the beginning of each game, by each reporter in the game. The sentence consists of the 5 W's (Who, What, When, Where and Why ). C) Scooped----This is when one of the reporters discovers the scoop of one of the other reporters and reveals it out loud. The second reporter has been "Scooped" and is out of the game. 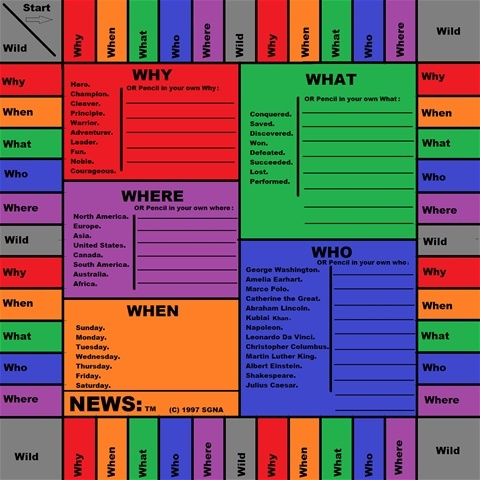 D) News Paper---This is a 8 inch by 11 inch stylized single sheet of paper used by each Player in the board game "News™". dice is red and one dice is white. The white dice is used for counting the squares as each player's token travels around the track. The red dice is used to let each player (reporter) know how many GUESSES he/she gets on that turn. Each reporter that plays News™ is given a token at the start of the game, to represent him/her on the track. All the tokens are different colors. Each reporter is given a "News Paper" at the start of the game. The news paper is approximately 8 inches wide by 11 inches long. It is labeled at the top, along the width (horizontally),"NEWS PAPER". The paper is divided up by lines horizontally into 3 sections. The top section is divided up by lines into 6 parts, vertically. Part one of the six parts is used for a list of the reporters that are playing (up to 8 names). Part 2 has a heading labeled "who". Part 3 has a heading labeled "what". Part 4 has a heading labeled "where". Part 5 is "when" and part 6 is "why". The middle section of the news paper (section 2) has a heading labeled "NOTES" and the rest of this section is left blank. Section 3 at the bottom of the news paper is about one inch high by 8 inches long and is labeled "YOUR SCOOP". 5) Game Pieces:8---small pencils,8-----tokens,1---playing board,1---refill book of "news papers",2--6 sided Dice, 1---rules sheet. "Conquered", the where is "Australia", the when is "Wednesday", and the why is "Cleaver". Once your scoop is written on the bottom of your news paper; then this area of your news paper is folded so the other reporters (players) can not see what you have written down. Once all the reporters have their scoops finished. Pick one player to start and then play always moves in a clockwise direction. The first player roles the dice and for example, say a 3 roles up on the white dice and a 6 roles up on the red dice. The reporter moves his token 3 squares in a clockwise direction and lands on the "WHERE" square. The reporter then has 6 "where" GUESSES on the other reporters. He can use all 6 guesses on one reporter or divide the 6 guesses up any way he wishes between the other players. The guesses are picked from the words under the labeled heading "where" in the center part of the playing field. If he (player one) asks one of the other reporters ( player two) if his "where" is Australia and player one is correct. Then player one marks down, in section one of his news paper, that player two's "where" is Australia. The other players at the table will hear this and should mark down in the NOTES section of their news paper that player two's "where" is Australia. In this way the other players are assured of a correct guess on player two when they land on a "where" square. The other players can not write Australia in on their section one of their news paper until they have guessed, on their turn, that player two's "where" is Australia. 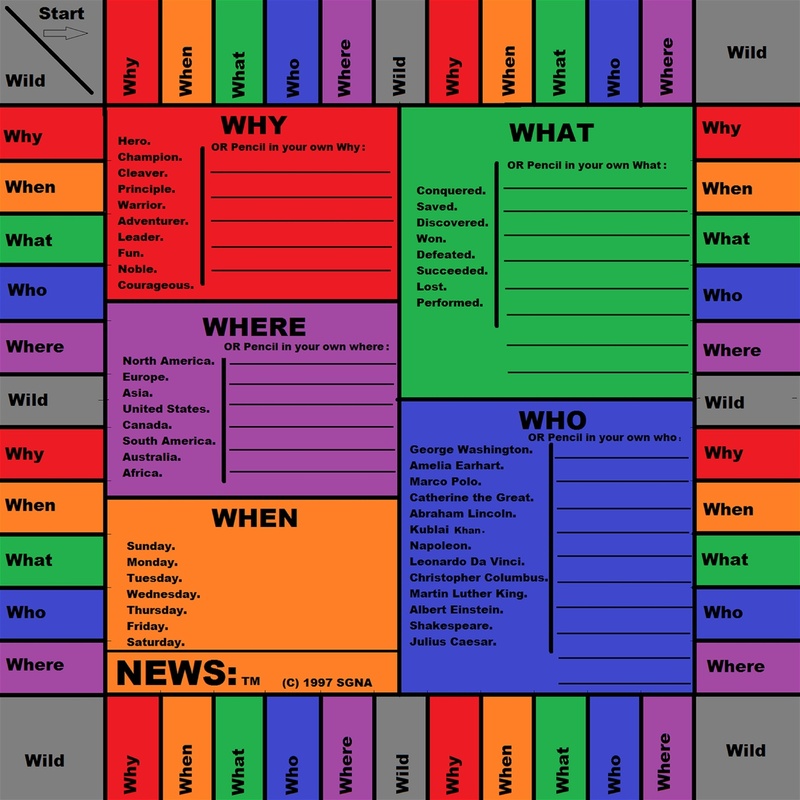 This principal (game methodology) applies to all the players in all the categories on the "who, what, when, where, and why" squares; and the "WILD" squares. If a reporter lands on a "wild" square with his token and roles up, say 4 guesses on his red dice; then he can divide his guesses up among the categories "Who, what, when, where, and why", any way he wishes. Example: 2--Who guesses, 1--What guess, and 1--why guess on the other reporters. This principal applies to any number of guesses that role up on the dice and under all the categories. As the game progresses and the players token move around the track; each reporter tries to figure out the scoop of the other reporters by guesses and taking notes. Once one (first) reporter thinks he has the scoop of another (second) reporter, written in section one of his news paper [ a scoop written in the notes section of a news paper does not count ] the first reporter, on his turn, can ask the second reporter if the "who, what, when, where and why" of his scoop has been figured out correctly. If it has been figured out correctly, then the second reporter has been SCOOPED and is then OUT of the game, his token is removed from the playing board. During the course of the game the reporters can not look at or copy the notes or information from section one of the news papers from each other. As the game progresses, the reporters will be scooped by each other and the last reporter with his/her token still on the track playing board is the WINNER.